Gorari was a small village on the Kokoda-Buna track some kilometres east of Kokoda. 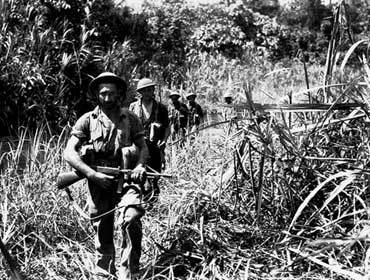 Here two platoons of 39th Battalion under command of the redoubtable Captain Sam Templeton, together with elements of the Papuan Infantry Battalion, on 25 July 1942, mounted an ambush against Japanese forces advancing from the coast. Greatly outnumbered, the Australians were quickly forced to withdraw along the track which led back to Kokoda. Captain Templeton was killed during this short action. During the counter offensive, Gorari was the scene of a bloody battle, involving four A.I.F.Battalions, against strong enemy forces skilfully entrenched and determined to defend what was a major supply base. 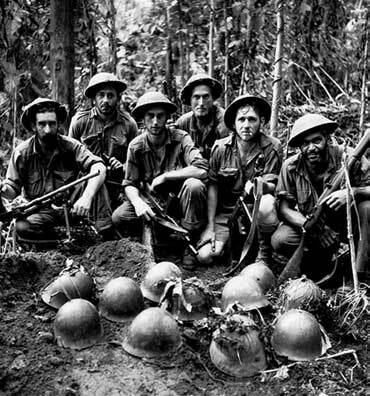 On 5 November, 1942, when the 16th Brigade reached Oivi on the Kokoda-Buna track, via Kobara, they met stiff Japanese opposition. 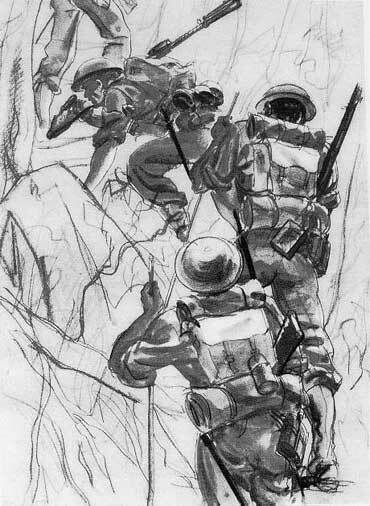 At Kobara the 2/1st Battalion had been ordered to clear a secondary track to Asisi near the Kumusi River. This track was roughly parallel to and some kilometres south of the main Kokoda-Buna route. Along it Major General Vasey sent the 25th Brigade, consisting of the 2/25th, 2/31st and 2/33rd Battalions, ordering it to strike north to Gorari via a newly discovered path which started at Leaney’s Corner. The Brigade left Kokoda at dawn on 7 November with the 2/31st Battalion leading and camped astride the track that night at Leaney’s Corner. Here the Brigade was joined by the 2/1st Battalion returning from Asisi. Next morning, moving north, the 2/31st Battalion struck strong resistance near Vardu. the 2/25th Battalion swung right and came in behind this force. On the morning of 9 November, the 2/33rd and 2/1st Battalions hooked still further right, the former to attack Gorari village and the latter to attack the enemy to the east of the village who had dug strong defensive positions on the main Kokoda-Buna track. During the next three days all four battalions fought with exemplary courage against the Japanese who were frantic to break out of the pincer movement so cleverly devised by Major General Vasey. Each battalion was heavily machine-gunned and mortared and, worse, pounded at close range by the deadly Japanese 3 inch mountain artillery piece, which fired both high explosive and air-burst shrapnel shells. Without artillery support and medium machine guns the Australian battalions had to rely on light weaponry, grenades and bayonets. They were already exhausted by the campaign in the Owen Stanley mountains, and having to stand-to throughout each night against the sustained, ferocious and unpredictable attacks of a trapped enemy desperate to escape, was the ultimate test of their tenacity and discipline. By early morning on 11 November, resistance in the 2/25th and 2/31st Battalion sector had ceased and some 500 dead Japanese were counted. These battalions then moved north, the 2/25th Battalion to the main track between the 2/33rd and 2/1st Battalion positions. Two companies of 2/31st Battalion joined 2/1st Battalion, attacking from the south-east at 5.30 pm and killed 74 Japanese. All fighting in this final joint battalion action had ceased by 7 pm, the routed Japanese fleeing east to the Kumusi River. More than 300 enemy were killed in the 2/33rd and 2/1st Battalion sector. Thus all Japanese forces in the Yodda Valley had been smashed, but not without considerable Australian losses. Since mid-September, 1942, when 25 Brigade moved into the Owen Stanleys, until the Kumusi River, its losses were 126 dead, 317 wounded and a greater number through illness had been evacuated.